If you missed my post from Monday, we've been homeschooling for five full years now and are a week into our sixth year. I really don't know how it's been so long as I still clearly remember that first semester of homeschooling with the utter relief and happiness we both felt. Of course there have been rough times strewn throughout the last five years, but overall it has been a wonderful experience. Fourth Grade: Our first week of homeschooling, five yeas ago. School this week has been a bit reminiscent of when we adopted our two angora kitties in 2013: a lot of time spent in the guest bedroom keeping a cat company. Except this time it is Biscotti who is still in the guest bedroom separated from the other cats. He seems to be a little less anxious overall, but still not able to handle the sight of the other two cats through a cracked door without hissing and growling. We're working on the slow re-introduction, but progress is, well, rather slow. Biscotti is very anxious following every attempt and after last week's flare of his IBD, we'd rather keep him from having too many anxiety attacks. Which means that our family takes turns in being out in the main living areas of the house to live a normal life - otherwise known as entertaining the other two cats, because that's our function in life. We also all spend time in the guest room with Biscotti because he is terribly lonely otherwise and so badly wants to roam free through the house again. He does get time out of the bedroom while the other two cats are put in Amber's room. Yet the house is a somewhat scary place for a Biscotti at times. He is always looking for the other cats and not willing to walk about on his own for the most part. This week Amber and I have conducted the lessons we work on together in the guest bedroom while sitting on the queen sized bed in there. I must say, with the way the bed is positioned in the corner of the room, it makes a nice place to have school. We've got pillows at our backs against the walls, plenty of room for us both to stretch out our legs and still let Biscotti sit nearby, and space to spare for all of the books, laptop, and iPads. Biscotti hanging out in his bedroom. We miss him roaming about the house. 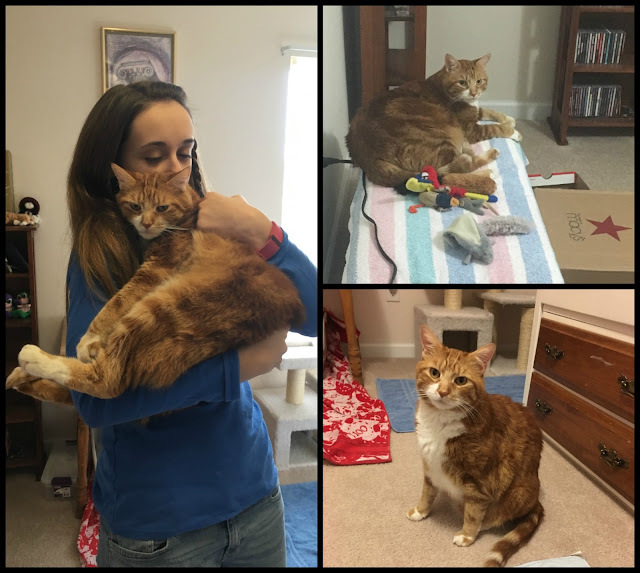 Amber has still been completing her independent work in one of her three desk locations, which are all within speaking distance of the guest bedroom. So even if I'm sitting with Biscotti, Amber can still call out for my help. Or she can do it the lazy way like we've all been doing lately, and texting whoever is in the room with Biscotti. It's rather silly, honestly. 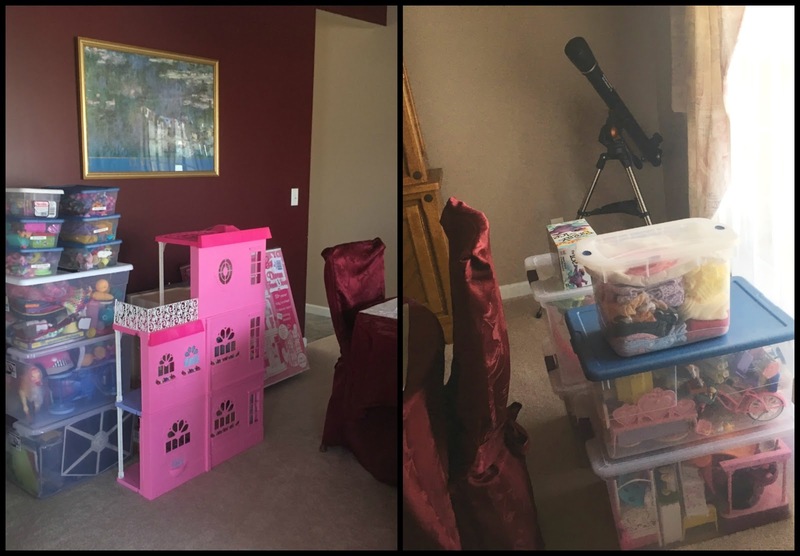 Last weekend I finally kept my promise to help Amber transform her playroom into the "not-playroom". 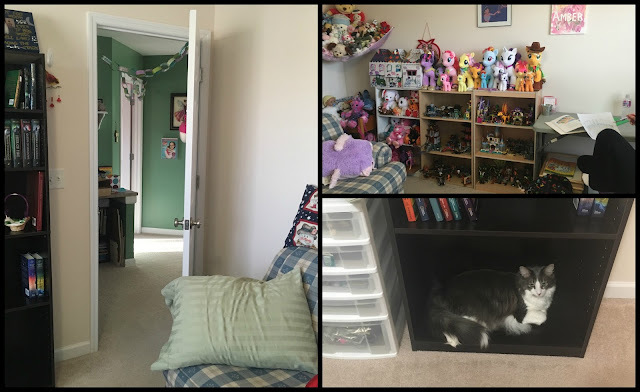 While it was a difficult decision for her, Amber decided several months ago that it was time to put away her childhood toys. There were not many left, but still it required a bit of work to put away all of the Barbies and the three doll houses, the American Girl Dolls and all of their clothing and accessories, the Star Wars toys, and all of the miscellaneous toys that were still available in the playroom. In the end, it was too hard to completely put away the American Girl dolls, so they now reside on the top three shelves of one of Amber's new bookshelves. All of the American Girl accessories and clothing have been packed up and stored, but the dolls are still accessible. The room has now become a Lego haven with added bookshelves for actual books, instead of toys like we had arranged it before. Of course Amber's TV and couch are still in the room, but it all looks much more grown up and like a teenager's special area. I really have no idea what to call the room anymore. 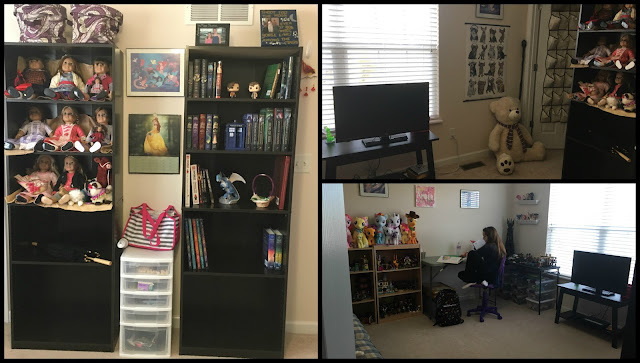 Fred offered up "Room of Requirements", as in the room in Hogwarts from Harry Potter because we often change the playroom around to suit Amber's current needs. I was not fond of that name, no matter how fitting it might be. It's also too long to say in regular conversation when referencing the room. I know myself and I would still call it "the playroom". Playroom transformation. Gone are all the toys, except the Legos and stuffed animals. Sniff. Fred then offered "the sanctum" or "Amber's sanctum". I'm still not in love with that name, yet again it fits the room. Fred predicted Amber would love that name, and he was right. She's been trying all week to help me remember to call her extra room "the sanctum". I'll see if it sticks. But really, I probably shouldn't be the one naming rooms in this house. We have a small room downstairs that isn't exactly a mudroom, but isn't exactly another type of room either. Sigh. When we first moved in I couldn't figure out what to call it and kept referencing it as "the little room" or "that little room over by the kitchen". Guess what we still call that room? The Little Room. Anyway, we did not put a school desk in Amber's Sanctum, but the new arrangement allowed her to finally clean off the Lego table in order for it to be again used for the intended purpose of building Legos instead of storing Legos. That also means it is available as a school work surface. I'm allowing it since Amber is still in a quiet area and she's getting work done. She's also got her TV in the Sanctum, which is where she does all of her subjects with video lessons. So, I guess using the Lego table for a school desk might end up to be a thing in the future. Which means I'll end up feeling like it's too folding table-like for school and buy her a desk to use as a Lego building surface. Again, the Room of Requirements is looking more and more appropriate. The remainder of the updated playroom pictures - with Milori on a bookshelf. That cat loves any hard surface. In actual school news, we've made a lot of headway in German, history, and literature this week. Other subjects were represented too, but those three made significant progress due to spending a good deal of time together in the guest bedroom. It's not all bad that we have been forced to spend more time at home lately. Okay, so forced is not the right word. We've chosen to do so because we are tired, sickly, and our cats need us. Amber is writing and should be close to finished with her writing assignment for Pride and Prejudice. We will move forward with the next literature novel while she polishes the last of her essay. I'm still waffling on what the next novel will be. I wanted to do Frankenstein when I originally scheduled the year, but I think Ivanhoe might be a better choice at the moment. I don't know that either of us is feeling like reading Frankenstein just yet. Next week we will need to pick up Tapestry of Grace again even though it has been fun to take a temporary break to work on some Ancient Greek lessons. Still, it's time to get back to our regularly scheduled lessons if Amber is ever going to complete this year plan. I also need her to get to the Civil War portion of history so that her literature assignments in the next few months match up with her history lessons. What's the point of planning it all out nicely if I let her get too far behind in history. 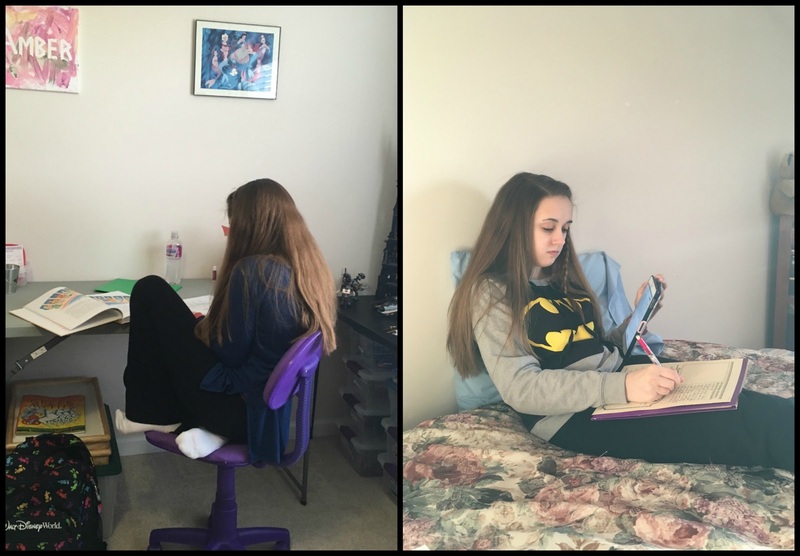 Greek mythology homework in "The Sanctum" and Ancient Greek homework in Biscotti's bedroom. Amber isn't working on science at home for the most part right now since we have forensics at co-op. This week we worked on understanding fingerprints and lifting them from a surface. It's not as easy as it sounds or looks on TV. The kids did a great job in class, but I had an awful time creating the fingerprints that would be easily lifted. There's an art to leaving a fingerprint on a slide, apparently. Too much skin oil on your finger and the print holds too much of the fingerprint dust. Too little oil and there isn't enough dust to discern the print. Still, the lab worked out well in enough in class that the students were able to deduce which prints matched each other in our crime scene. Whew! Remind me to never assume any part of this class will be "easy". Giving Amber the semester off of math since she is so far ahead has been the single best school decision of the month. She dreaded starting math again and now has a renewed interest in her lessons knowing that math will not be a subject she is asked to complete for the current semester. I can't forestall math forever, but for this semester we can let her focus on the humanities. This weekend I need to work in our basement organizing all those toys we removed from Amber's playroom, but I think instead I will organize our 2016 files and get the paperwork ready for the taxes. That seems a bit more pressing than organizing a place we don't necessarily use daily. My dining room. This is all of the stuff that STILL needs to make its way to the basement. This doesn't include the donation items already in that pile or the things already taken down. And no... the Barbie town house does not disassemble. My 1975 Barbie Townhouse did disassemble and is still going strong. Hmm. That must say something. Wish us luck attempting to integrate Biscotti back into daily life outside of the guest bedroom. What a sweet look back at the start of your homeschool journey! I hope Biscotti will be able to join the rest of the family and get along with the other kitties soon. I hope you get things worked out with Biscotti... poor cat! visiting from homeschool highlights. I do hope Biscotti is able to readjust. What a difficult time he is having. My son is really shedding his childhood things right now too.